Corals usually develop into one of three characteristic structures: fringing reefs, barrier reefs or atolls. Click the image to see an animation. Coral reefs begin to form when free-swimming coral larvae attach to submerged rocks or other hard surfaces along the edges of islands or continents. As the corals grow and expand, reefs take on one of three major characteristic structures —fringing, barrier or atoll. 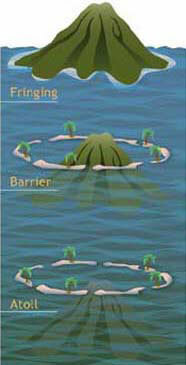 Fringing reefs, which are the most common, project seaward directly from the shore, forming borders along the shoreline and surrounding islands. Barrier reefs also border shorelines, but at a greater distance. They are separated from their adjacent land mass by a lagoon of open, often deep water. If a fringing reef forms around a volcanic island that subsides completely below sea level while the coral continues to grow upward, an atoll forms. Atolls are usually circular or oval, with a central lagoon. Parts of the reef platform may emerge as one or more islands, and gaps in the reef provide access to the central lagoon (Lalli and Parsons, 1995; Levinton, 1995; Sumich, 1996). In addition to being some of the most beautiful and biologically diverse habitats in the ocean, barrier reefs and atolls also are some of the oldest. With growth rates of 0.3 to 2 centimeters per year for massive corals, and up to 10 centimeters per year for branching corals, it can take up to 10,000 years for a coral reef to form from a group of larvae (Barnes, 1987). Depending on their size, barrier reefs and atolls can take from 100,000 to 30,000,000 years to fully form.